We said that plants, trees and fruits have spirits; just as that man has a soul and animals have spirits. So that if a tree of 'the present World' is cut and is dead, then its spirit will not die, but will remain alive for ever, and it will be fresh, having a lot of branches full of fruits; its leaves won't fall and its fruits will not be depleted; it won't need manure or water; no coldness can cause its death, nor can any disease do that. These ethereal trees will go to the ether world; then every good tree will be taken by the angels to the heaven to be one of the Paradise trees. [The good tree] is every tree having good fruit or nice smell, like the flowery trees and aromatic plants; so that the dwellers of Paradise will have pleasure with it, eat of its fruits, sit in its shade and be delighted with its view. Giving its fruit at all times with its Lord's leave. >> (its derivation is permanent [on earth]) means: its origin [or derivation or kind] is remaining on earth. He means by that the material tree; for it is remaining on earth, and many trees branch or stem from it; that is by seeding, pruning or trimming. >> (and its derivatives are [taken] into heaven) means: What ethereal trees branch or stem from it, will go to heaven and become some of the Paradise trees. >> (Giving its fruit at all times) means: The good ethereal trees give you the fruit always, and it hasn't any limited [season] time like the trees in the life of the World, which give their fruit only at spring time. I.e. (Its food is perpetual, and [likewise] its shade) means: Its fruits are always present on the trees. Whereas the material lote tree, which is on the earth, gives its fruit twice yearly: once in Spring and another time in Autumn. The length and size of the ethereal tree is according to how much it lived in the life of the World. So as much as it lives [in the World], the ethereal tree will be longer, bigger and have more branches and fruits. and so on wherever he is in his palace, the fruit will be near to him. and by that, souls are able to climb trees and take the fruits from them easily; they can even stand on the high parts of trees like birds. Ethereal trees will not have new fruits like our trees in the life of the World, but only they bear their old fruits which they had borne in the life of the World, and those fruits will remain there: neither do they putrefy, nor do they deplete or finish forever. I.e. (And those pertaining to the right[i]; what [a reward] will be [for] those pertaining to the right! Therefore, (Neither limited in time nor forbidden) means: That fruit does not finish from the tree, and none will prevent them from taking it, so it is their own and they have free hand over it. The eating [and drinking] in the ether world is not as a nutrition to the body, but it is only for tasting and pleasure; so that as much as man eats and drinks, he will not have indigestion; because the food gets out of the sweat orifices of their ethereal bodies less than an hour afterwards, in the form of sweating, and it returns back as it was at first; for this reason, they do not urinate and do not defecate. Hence, a fruit, which a soul eats in the ether world, gets out of the sweat orifices of their ethereal bodies, and becomes a fruit once again as it was at the start, and returns back to its tree. The bird also that souls eat will come out of the sweat orifices of their ethereal bodies to be a bird once again and return to its nest. As such the fish eaten by souls will an hour later come out of the sweat orifices of their ethereal bodies and return back to the river. Therefore, their eating and drinking is not for the nutrition of the body, as is it to us in the life of the World, but it will be for tasting and pleasure; and as much as they may eat, they won't have indigestion. I.e. ([Surely] those ‘who ward off [the disobedience of God]’ shall [promenade themselves] in the shade [of the trees of Paradise] and [shall drink of its water] springs. That is because they are ethereal, and their food is also ethereal; so that they will not have any indigestion how much they may eat and drink. The fruits whereof being near [at hand] for culling. i.e. (Eat [of the fruits of the Garden] and drink [of its rivers]), and He did not restrict that; because it is ethereal [food], and the ether does not cause indigestion to man. and the excessive sexual intercourses, and ingesting food over food." As regards the 'goodly' word; it is to mention God with praise and celebration, and to defend Him.  Glory be to God, and so on. >> Whereas to defend God; it is like rebuking someone who blames or censures God, and you will reply and rebuke him. If you hear a person deny God, or speak badly about God, then you must rebuke and beat him; in order that he will not repeat such words again; but if you cannot rebuke or beat him, then tell the police-office about him, so that they will bring him to judgment, and the judge will rebuke and imprison him; and don't say that this matter does not concern me; it does really concern you and concern every person who hears by his ears, and you must enjoin righteousness and forbid evil. So you must defend God; as does He defend you. So the rebuke and preventing the disbeliever and blasphemer from his disbelief and blasphemy is the 'goodly' word that you speak, then the angels will take it up to heaven and write it down in the 'Preserved Tablet'; so that it will remain for ever; and whenever an angel passes there, he will read it, so you will have a good fame or reputation in heaven, and it will be said that this is the man who defended God. Therefore, such are the 'good words'. It means: The angels, who are brought close, see it. Isn't the 'eye'[iv] one of the body organs? Answer: God – be glorified – did not mean by the Arabic word أَعْيُن the two eyes of man, but He meant by that the glands which are in the mouth of man, which secrete fluids; and these are the origin of taste and pleasure [of food]; and it is not that the taste and pleasure of food is by the eyes but by the mouth. Bad or evil trees are those having thorns, without fruit that can be eaten, having a foul smell and do not provide shade to the one sitting under them, in addition to the thorn that they have. Such trees remain on the earth, and the angels do not raise their spirits to the heaven; so that if the wind blows they will be taken off from their insertions, i.e. uprooted, and will be pushed to where the wind moves, and will be destroyed and fall on the ground carried with the winds from place to place, having no rest; so that you may see a branch here and a branch there; and you see a tree behind this wall and another behind that curtain, while another one might be between the mountains, which keep them from the winds. while as regards the material one, it was uprooted by our father Adam after he had eaten of its fruit, and it was the cause of his disobedience and his coming down from the garden, which was on a mountain, to the plain land; it was the blackberry tree. >> (having no stability) means: It goes from one place to another; because the winds carry and cast it in the depressions and between the mountains. Some photographers found, in their films, some photographs of trees or branches that were picked by their cameras, by chance and without being aware of them, in places where there were no trees. This may take place when the light given to the film is very little, so that the film comes out without the picture of the man in front of the camera, but – instead – the photographer will find a picture of a tree or a branch of a tree in spite of that the place is devoid of trees[v], but he doesn't know the reason for that, and does not understand that there are ethereal trees which are unseen by the living beings, but that the cameras pick them by chance, in spite of that some people are not aware about the existence of the ethereal trees. A photograph of an ethereal branch has been picked by the camera of a photographer at Hilla [in Iraq], and that was in one of his house rooms. It is narrated that Hajjaj [: a governor of Iraq, in the Umayyad era] asked Ali, the son of Hussein, about Paradise dwellers: is it right that they do not sleep, neither do they pass urine nor do they pass bowel motion? I.e. (and has made us inherit the [ethereal product of the] earth)? I.e. (and has made us inherit the [ethereal product of the] earth) means: And has given us, as inheritance, that which had been produced from the earth, i.e. what the earth had left behind. It means: They will inherit what fruits, palaces and other things belonged to the associaters and idolaters in the life of the World, and that will be for believers as an inheritance for them in the Next Life. >> (gives to every [material] thing [whether it is plant, animal or man] its [ethereal] form) means: He gives to everything of the plant, animal and man its picture which is according to its shape, and He means by that the ethereal soul [or spirit] which is an image [or true copy] of the body. Therefore, the word شَيْء i.e. 'thing' is said as regards to the matter. The meaning: He gives, to every living body, its life by introducing the spirit into it; so that it becomes alive. >> (“then He guides [it to its livelihood and the means of getting it. ]”) means: Then He guides it to the affairs of its daily life, and how it can obtain its sustenance; so that He guides the animal with the instinct, and guides man with the intelligence and mind. It means: It will be destroyed and cut up into many pieces. I.e. (Race[x] [with each other] for forgiveness from your Lord and [for] a Garden the extent of which [in the space] is equal to the extent of the heaven and the earth, prepared for those who believe in God and His messengers)? It means: Its extent is like the extent of the planets as much as they are widely ‘scattered and extended’ in the space. The 'heavens' means: the planets. The meaning: Its extent is equal to the extent of the planets, as widely as they are ‘scattered and extended’ in the space. >> (whose extent) means: Its size and extent. Therefore, the ethereal Paradises are the chair of the Lord of Glory, and the "Throne" is over them; the meaning is: The size and extent of the 'Chair' is like the extent of the planets as much as they are widely scattered in the space. Question 22 If the heavens were ethereal, then how did the Christ ascend up to heaven? Answer: His ethereal soul ascended to heaven, while his body remained on the earth. When the Jews intended to kill Jesus Christ, God [confounded them and] made a man similar to the Christ; so they took that man and crucified him. While Jesus Christ escaped from them, and went to a hill [in Syria], then his mother followed him there, and they stayed on that hill worshipping God - be glorified. Then a period of time later, Jesus Christ died on that hill; so his ethereal soul ascended up to heaven, while his body was buried on that hill. وَإِذْ قَالَ اللّهُ يَا عِيسَى ابْنَ مَرْيَمَ أَأَنتَ قُلتَ لِلنَّاسِ اتَّخِذُونِي وَأُمِّيَ إِلَهَيْنِ مِن دُونِ اللّهِ قَالَ سُبْحَانَكَ مَا يَكُونُ لِي أَنْ أَقُولَ مَا لَيْسَ لِي بِحَقٍّ إِن كُنتُ قُلْتُهُ فَقَدْ عَلِمْتَهُ تَعْلَمُ مَا فِي نَفْسِي وَلاَ أَعْلَمُ مَا فِي نَفْسِكَ إِنَّكَ أَنتَ عَلاَّمُ الْغُيُوبِ .مَا قُلْتُ لَهُمْ إِلاَّ مَا أَمَرْتَنِي بِهِ أَنِ اعْبُدُواْ اللّهَ رَبِّي وَرَبَّكُمْ وَكُنتُ عَلَيْهِمْ شَهِيدًا مَّا دُمْتُ فِيهِمْ فَلَمَّا تَوَفَّيْتَنِي كُنتَ أَنتَ الرَّقِيبَ عَلَيْهِمْ وَأَنتَ عَلَى كُلِّ شَيْءٍ شَهِيدٌ . إِن تُعَذِّبْهُمْ فَإِنَّهُمْ عِبَادُكَ وَإِن تَغْفِرْ لَهُمْ فَإِنَّكَ أَنتَ الْعَزِيزُ الْحَكِيمُ . I.e. (And [keep in mind] when God said [to Jesus after his death and ascending to heaven], 'Jesus, son of Mary! Is it you who said to people: take me and my mother as two gods, apart from God?' [Jesus] said: "To Thee be glory! I haven't the right to say what I have no right to. If I had said it Thou would have known it; Thou know what is in myself but I know not what is in Thyself; it is Thou Who knows unknown secrets." "I never told them save what You had commanded me [saying] – 'Worship God, my Lord and your Lord', and I was a witness of them so long as I was [alive] among them; but when You took me [after death] to Yourself, You were the Watcher over them; for You are the Witnessing of everything." Therefore, the saying of Jesus Christ: (But when You took me [after death] to Yourself) means: But when You caused my death. The meaning: I will cause your death, and raise your soul to Me. The interpretation: Those among you that are about to die, must bequeath for their wives that they should be given sustenance for a whole year. The indication that the Christ was not crucified, but that a man similar to him was crucified, is that his disciples saw him three days after the crucifixion, they spoke to him and he spoke to them. "16- And the eleven disciples went into Galilee, unto the mountain where Jesus had appointed them. 17- And seeing him they adored; but some doubted." "36 While they were talking about this, Jesus himself stood among them and said to them, "Peace be to you." 37 They were startled and terrified, thinking they were seeing a ghost. 38 He said to them, "Why are you frightened, and why are doubts arising in your hearts? 39 Look at my hands and my feet, for it is I myself. Touch me and see, for a ghost doesn't have flesh and bones as you see that I have." 40 After he had said this, he showed them his hands and his feet. 41 While they still could not believe it for joy and were full of amazement, he said to them, "Do you have anything here to eat?" 43 and he took it and ate it in their presence. " Question 23 If the heavens were ethereal, then how did Prophet Mohammed – salam to him – go to the heaven on the night of the 'ascension'? His ethereal soul ascended to the heaven; while his body was sleeping in his bed; for it is mentioned in a book called 'The Ascension' that the prophet – salam to him – went with Gabriel [from Mecca] to Jerusalem, and there he met the prophets, greeted them and led them in prayer at Jerusalem. Then he ascended with Gabriel to the heavens, and led the angels in prayer in each heaven, till he reached the seventh heaven. I say that the prophets went, by their death, from the material world to the ethereal world, and they became ethereal souls; and souls cannot be seen by the living material beings. In addition to that, angels are ethereal creatures whom people cannot see save under certain conditions. Thirdly, man cannot ascend to heaven with his material body. For this reason, the 'ascension' took place at night. Moreover, it is narrated from Aisha, mother of the believers, [the wife of the Prophet] that she said: "By God, the body of God's messengers, salam to him, did not go, but only he ascended with his spirit.' It is also narrated from Muawiah, a similar tradition. The 'Inviolable Mosque' means the Ka’aba at Mecca; while the 'Remote Mosque' is at Jerusalem. Prophet Mohammed – salam to him – was taken into a night journey from Mecca to Jerusalem; and he was actually taken into such a journey at night; because the soul is annoyed by the noise, and avoids the light, specially the sun-light. For this reason, he went into his travel at night; because people were sleeping, sounds were low, movements were calm and the sun had set off; so that the time was suitable for his journey to Jerusalem, and then for his ascension to the heavens accompanied by Gabriel; because he had become an ethereal creature like his companion. And because the ascension was with the ethereal soul, he was able to see the prophets and lead them in prayer to God, and he was able to see Gabriel, and was able to ascend with him to the ethereal heavens, and was able to see the angels and talk with them, and so on of what was narrated from Prophet Mohammed – salam to him. 3- Nor does [Mohammed] speak out of [his own] desire. 5- [Mohammed] is taught by [Gabriel: an angel] mighty in power. 12- Will you then dispute with him concerning what [portents] he saw? 15- Near to which is the Garden of Refuge. >> ([I swear] by the [tailed] star [: the comet] when it will fall down [upon the earth!]) means: I swear by comets when they will fall down on the earth. Endowed with power, and is ‘authorized and supported’ by [God:] the Lord of the Throne. >> ([Mohammed] is taught by [Gabriel: an angel] mighty in power) means: Gabriel taught Mohammed the Quran and the Islamic law. >> (To whom is referred [by angels, prophets and messengers or apostles] for consultation) means: He is a consultant, whom angels consult in their affairs, as do prophets consult in their mission; because of his intelligence, brilliant mind and his high rank. >> (And [Mohammed] became similar to, and together with, [Gabriel.]) means: Mohammed became equal to Gabriel in the kind, and the ascending up to heaven on the 'night of the ascension', i.e. they became of the same kind; because Mohammed ascended with his ethereal soul, and as such was Gabriel also an ethereal creature; and that they ascended together to heaven. >> (Then [Mohammed] drew near [to the Throne, to which he] was guided [by Gabriel]) means: Gabriel was at some height of the earth's atmosphere, when he was teaching Mohammed the religious instructions. So: (Then [Mohammed] drew near [to the Throne of the Lord]) means: Mohammed then approached the Throne. And: ([to which he] was guided [by Gabriel]) means: Gabriel guided him to it. It means: The [spiritual] heart of Mohammed did not unbelieve what signs and surprises he saw in the ethereal heavens on the night of his 'ascension', and he did not doubt about what he saw; because it was inscribed [and fixed] in his memory. 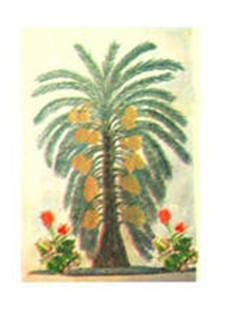 It means: At the end of their tour in heavens, and that was near that lote-tree, which was an ethereal tree and its fruit is the lote-fruit. >> (Near to which is the Garden of Refuge) means: Near that lote-tree, there is the Paradise of Refuge, to which souls of prophets, saints, martyrs and the righteous will go, in the Barzakh world, and have shelter and dwelling there. It is the lowermost layer of the seven heavens, and it is not the Paradise of 'Everlasting', into which they will be admitted on Judgment Day. It means: He will be admitted into the first Paradise in the Barzakh world or the afterlife, and he will be admitted into the second Paradise on Judgment Day. >> (The eye-sight [of Mohammed] deviated not, nor yet did it wander beyond [his goal.]) means: His sight didn't deviate from what he was to see, and did not go far from it. In other words: Mohammed was only looking forward, and did not look right and left; and that was an act of politeness and as a glorification to his Lord. A man named Abbas Al-Abdali, who dwelt at the Asshar quarter in Basra[xvi], once became ill and was about to die; he fainted, and his ethereal soul got out of his body, at night time; his soul made a tour, then returned back to his body. Man wishes to lead a good life, and to be in continuous prosperity; so that you see him work and toil to get what he desires. The young man, for example, works day and night and bothers himself to obtain some money with which he may live in his elderly. And the student studies day and night and bothers himself and his mind for eleven years [or eighteen years] or more to secure his future, as for to get an employment by which he gets a salary that may suffice him. However, what is the period of time which man wants to secure his life during it!? Will it be ten thousand years? No. Will it be five thousand years? No. Then, how long will it be that period for which man works and bothers himself? It may be seventy years, and that may be very much; or it may be fifty or less than that. I knew a young man, who was serious in his learning; he completed the primary school, the secondary school and the college [in the university], but after all these worries and efforts, and of being vigil at night so frequently; his hour of death appointment came on him and he died, while he did not get any salary, not of one month even; so he lost his life of the World, neither did he gain his Next Life; because he didn't pray [the daily prayers], didn't fast [during Ramadan month], and didn't hold fast with the religion; so had he worked for his Next Life, even though it be a quarter of his work for his Worldly life, then he would have lived a good life in his Next Life; but he neglected about his next Life, and held fast with his Worldly life; therefore, he lost them both. I say: Isn't it more logical that man should work for his Next Life, to secure for himself a delightful future and a happy life? Isn't it more logical that man should offer what he has for his everlasting life, during which he will live for thousands and millions of years, when he will not die neither will he become old? Therefore, every wise man should offer what he has [in this life of the World] for his Next Life, and should do, here, what will benefit him in his next everlasting life [in the world of souls following his death], in order that he may secure for himself a happy future, and be at rest in that world, where he will soon go, and he may meet there his wife and sons, and live there a happy life. Question 24 What should we do in the present life of the World; in order to secure for ourselves a [good] future in the Next Life, so as to live a good and happy life [there]? It means: They will not be rewarded according to their righteous deeds, but such deeds will go the way of the winds, just like how the scattered [dust] particles go in the space; that is because they associated, with God, other than Him in their worship. I.e. (God does not forgive that anything should be associated with Him, but forgives anything short of that, to whomsoever He pleases. Question 25 We are a people [following] the heavenly scripture [: Christians and Jews], so are there any associaters among the people of the Scripture? Answer: Most of people, nowadays, are associaters and polytheists, but they don't know that they are associaters and polytheists! And most of people are moving in the wrong way, but they think they are rightly guided! It means: They commit some acts which God doesn't agree about; whilst they think that their deeds are good, and that God is pleased with them and with their deeds. Question 26 Would you teach us what the association and polytheism is; in order that we may avoid it? Answer: The association or sharing is to ascribe one (of the prophets, imams, sheikhs, or saints) as a partner or associate with God; so that you worship God and worship that partner just as you worship God. Or you may seek the help of anyone [like Moses, Jesus, Mohammed, Ali] other than God, when you stand up and sit down. Therefore, this is the association [: sharing or polytheism]. It is just like that we say: 'John is the copartner of Simon in the trade', and we mean by this: that the trade is shared between them, so that they are partners or associates in it. In other words, the association [or sharing or polytheism] is to worship anyone other than God just as you worship God. "The worst of acts that I fear my nation may do is the sharing [or associating partners or associates] with God. I don't say they will worship the sun or moon; but they may carry out some works for the sake of those other than God." Question 27 Is there anyone that may worship others besides God? Answer: Yes, a large number of people worship others, in stead of God, while they are unaware. Question 28 The worshipping of God is the fasting and the prayer, isn't it? But in fact we fast for our Lord, and we pray to Him, and never do we pray to anyone else! First – Mentioning of God. That is by mentioning and remembering God always with praise, and to thank Him; so that if you mention one of the sheikhs or imams [or saints] always, then you will share him with God. I.e. (Believers, mention God [in celebration] with much mentioning. And celebrate His praises, morning and evening.) It means: always. I.e. (mention God [in celebration] with much mentioning.) But He didn't say: Mention the sheikhs [or the saints] very much. So (by day and night) means: always. Second – Seeking the help of God is worship. That you say: 'O God!' when you stand up. Its meaning is: Help me O God! But if you seek the help of anyone other than Him, then you will share [him as a partner or associate with God]; even if you say: 'O Mohammed! ': because God does not want you to seek help of anyone other than Him. but actually you seek help of those other than God!" Third: Begging from God is worship; but if you ask your needs from one of the prophets, sheikhs, imams, rabbis or saints; then you will share another partner with God; for God does not accept from you to ask your needs from others in stead of Him. For I don't nock but the door of Your surplus [like a beggar.]" It means: I don't ask from anyone other than You, and I don't seek my needs but from You alone. and I seek my need only from You [Lord!]" "Moses, ask of Me, even though it be a bit of salt for your food." It means: Even though the salt is cheap and available, and the amount that you need for food is little; but you should not ask that from anyone other than Me; so ask of Me your need, and I will offer it to you. God – be glorified – will boast to angels about you; if you ask your need from Him, and will say to them: Look to My servant, whose name is so and so; he has inclined to Me and asked his need from Me; for he has realized that I am All-Able to do everything. Question 29 These Quranic revelations do not apply to sheikhs, imams, [saints and the Christ], but they apply to idols; then why do you apply them to sheikhs, imams, [rabbis, saints and the Christ]? I.e. (Those whom you pray, besides God, are servants [of God] just like you); He means by that the angels, not the idols; because Quraish [: the tribe of Prophet Mohammed] worshipped the angels, and said that the angels were God's daughters. The indication of that is His saying – be glorified – عِبَادٌ أَمْثَالُكُمْ i.e. (are servants [of God] just like you); for the idols are not servants, but are stones! Question 30 We do not ask our need from sheikhs, imams, [rabbis, saints, or the Christ], but from God. However, we consider these as mediators between us and God. That is just like when you want something from someone, then you may take another person with you so that this latter will be as a mediator or intercessor between you and him in order to carry out your need. Answer: People are two kinds: some of them are miserly and stingy, and some of them are generous; so that if you come to a miserly person, he will not carry out your need even though you bring to him a great mediator. But if your need is to [ask it from] a generous person, then he will give you what you need without any mediation. Then what do you think about God? Isn't God Generous? For the generous one will grant you your need without any mediation or intercession. But He didn't say: Let an intercessor or mediator be between Me and you! and I be alone with Him wherever I want to [complain to Him] my secrets; that is without an intercessor; and He grants me my need. And praise be to God: I pray Him, and pray none other than Him; if I call on anyone else, he will not answer my call." Fourth: The vowing to God is worship. It means: And that which has been slaughtered, as a vow or sacrifice, for anyone other than God. Therefore, one who eats the meat of a slaughter animal, while it is a sacrifice as a vow for one of the sheikhs, imams or saints, will be as if he has eaten pork; and in such instances the vow is forbidden, its eating is forbidden and the slaughterer is a sinner. If you wish to vow, then say: 'I vow for God's sake, that if He offers to me what I wish, I shall slaughter a sheep and distribute its meat to the poor and needy'. Then such a vowing is accepted, and you will be rewarded for it. Fifth: The Expending and offering in God's way is worship. See, then, that God – be glorified – said: عَلَى حُبِّه i.e. (for the love of [God]) means: for God's love; but He did not say: And they feed, for the love of the prophets, sheikhs, imams or saints. See also that He – be glorified – said: إِنَّمَا نُطْعِمُكُمْ لِوَجْهِ اللَّهِ i.e. ([Saying to them:] "We feed you only for the sake of God), but He did not say: 'We feed you only for the sake of sheikhs, imams and saints. Sixth: The naming. That is to name your son: Abd-Allah i.e. the slave of God; Abdul-Jaleel i.e. the slave of God's Majesty; Abdul-Kareem i.e. the slave of the Generous God; Abdul-Rahman i.e. the slave of the Most Gracious; or what is like that of God's Glorious Names; because it is a sort of worship. It is mentioned in a book entitled 'Nahj Al Balagha' that Imam Ali –salam to him- sent a message, to his son Hassan, including instructions and wise advises, in some of which he said: "And don't be a slave to others, while God has made you a free [man.]" Seventh: The glorification, exaltation and sanctification of God is worship. But it is not allowed to glorify and sanctify anyone other than God. Therefore, glorifying the graves and shrines of the prophets, sheikhs and saints; and their sanctification and kissing is a sort of associating [them with God in worship]; because God – be glorified – will not be pleased with you, if you do that; because, by doing so, you will leave the Creator behind and hold fast with the created persons, and that you will forget about the Provider (or the Sustainer) and ask your request from the provided one. I.e. (Anyone honors the [the compulsory and the voluntary] rituals of God), but He did not say: anyone honors the rituals of sheikhs, imams or saints. It happened that whenever Prophet Mohammed – salam to him – entered the mosque, his companions stood up to respect him; but he forbade them from that and said to them: "I am merely a human being like you; so do not glorify and sanctify anyone other than God: your Lord Who created you, and don't do like what the non-Arab do to their kings." It is mentioned in the book of 'Nahj Al Balagha' that when Imam Ali – salam to him – passed across Iraq in the battle of Nahrawan, some of the people of Iraq came to him kissing his hands and legs, glorifying and magnifying him; but he rebuked them, and drove them away and said to them: "What are you doing!? Don't do like foreigners who glorify and sanctify their kings! I am merely a human being just like you, then why do you kiss my hands and legs; for this is not allowed. The glorification and sanctification is exclusively for God alone." I say: if Imam Ali – salam to him – did not accept that anyone might kiss his hands and legs, while he was alive; then how does he, following his death, agree that they kiss his grave and the walls of his shrine and the threshold of the door of his shrine, and so on!? "16- And, behold, one came and said unto him, Good Master, what good thing shall I do, that I may have eternal life? “17- And when he was gone forth into the way, there came one running, and kneeled to him, and asked him, Good Master, what shall I do that I may inherit eternal life? Question 31 The imams and saints are our teachers and guides, aren't they? And we should like and respect them, shouldn't we? Answer: Yes, we like and respect them, but we do not glorify them, and we should not worship them; because the glorification is not allowed except for God alone; and any worship is not allowed except to worship God alone. 57- I desire of them no provision; neither do I desire that they should feed Me. Eighth: The oath (or swearing) by God is worship. That is you should be truthful in your oath, but if you swear falsely, then you will be a sinner. The oath is to say: "By God, the matter was so and so." >> (warding off [the disobedience of] God) means: Don't swear by God that you will not protect yourself from evil by any way; e.g. if you are sitting behind a wall together with a group of people, then your group look and see the wall about to fall down, and they tell you: Get up from your place or else the wall will fall down upon us; then you may swear by God that: I shall not leave my place even though the wall will fall down; because you will expose yourself to danger by such an oath. >> (and reconciling between people) means: And don't swear by God, that you will not reconcile people with each other; because by that you may abandon doing goodly [deeds], and enjoining righteousness. >> (for God is All-Hearing) of your words. >> ([and] All-Knowing) about your acts. However, it is not meant, by this aya (or Quranic revelation), the prohibition of the oath or the frequent swearing. Question 33 What should we do, in the present World, in order to secure a [good] future for us in the Next Life, and that we may live a good and happy life? Firstly and prior to anything else, you should avoid associating anything with God, i.e. to be a monotheist, not a polytheist; because the prayer and fasting of a polytheist will never be accepted from him whatever charity and righteousness he may do. and that you offer [out of your money] for the sake of God, and so on of good and righteous acts. Question 34 Which behavior or conduct does God like us to have? And which of that does He dislike? Answer: God – be glorified – likes the merciful person who has mercy towards the poor and needy, and has sympathy towards orphans, widows and elderly and strangers who have no families. He likes the generous person who offers to people out of his money, and will not be stingy with them. He likes the humble, who is not proud over the poor and other people. He likes the truthful man, the good-hearted man who does not cheat or deceive people, and does not lie to people and enslave them. I.e. (88- "The day whereon neither wealth nor sons will avail." "The money is My money, and the poor are My family; then whoever is miserly with regard to My family, I shall admit him into Fire, and I don't mind." "19- Lay not up to yourselves treasures on earth; where the rust and moth consume and where thieves break through and steal. 20- But lay up to yourselves treasures in heaven; where neither the rust nor moth do consume, and where thieves do not break through nor steal." The meaning: Expend your money, in the cause of God, to the poor, the needy, orphans and wayfarers; then you will find, what you expended, in heaven: in the neighborhood of God: in Paradise. A rich man should offer out of his money to the poor, the needy, orphans, widows and strangers or wayfarers; he should say: I give this [sum of money] for God's sake; and I offer to this man for God's sake; and he should have mercy to this and that person for God's love. Moreover, God dislikes the proud; the proud will be deprived of God’s mercy and will lose. Because Ibliess (or Satan) was one of the favorite angels; but when he became proud over Adam, and did not prostrate himself before him, God drove him out of the Gardens, and he was deprived of God's mercy. In addition to that, God dislikes the wrong-doer and transgressor who transgresses on people and takes, by force or illegally, their rights and possessions; God will deviate or mislead such persons from the way of truth because of their transgression, so that their fate will be in Hell. Therefore, man must accustom to be modest [not poud over others]; accustom himself to honesty with people, accustom himself to generosity, mercy and kindness: so as to show mercy to the poor and needy, and to be kind to orphans, widows and strangers who are far from their families; and he should accustom himself to righteousness in order to become one of the righteous. Question 35 If we avoid sins, and do righteous acts, then will we secure, for ourselves, a happy life in the ethereal world? All praise and gratitude is due to God, Lord of nations and worlds. 1- The Koran (QUR’ÁN) – Translated by E. H. Palmer. 3- The Glorious Kur’an .. Translation and Commentary – by Abdallah Yousuf Ali. 12- The Holy Bible – many versions. 14- Merriam-Webster Collegiate English Dictionary. 15- A Dictionary of Modern Written Arabic – Hans Wehr – Edited by J. Milton Cowan. 16- Al-Mawrid (English-Arabic & Arabic-English Dictionary) – by Munir & Dr Rohi Baalabaky. I may answer any question about the subject and the book, in case I know the answer; but certainly God is the All-Knowing, and the Guide to the standard way of monotheism and wisdom. [i] i.e. those that are given their book of deeds by their right hands, and who are given by the angels the glad tidings of their admission into Paradise. [iii] In Arabic, the word is used to give more than one meaning: 'eye', 'water-spring' or 'gland'. Here, according to the interpretation of the aya, it means: the glands which are in the mouth. [iv] In Arabic, the word is used to give more than one meaning: 'eye', 'water-spring' or 'gland'. Here, according to the interpretation of the aya, it means: the glands which are in the mouth. [v] That is because the ethereals have rays, and if the place, where the photograph was picked, was dark or of little light, then the rays of the ethereal tree overcome the darkness so that it will be picked by the camera, if there is an ethereal branch in that place. [vi] i.e. they inherit the ethereal copy of the Worldly material houses, clothes …etc. [vii] This indicates their large houses and their free movement in that wide Paradise. [viii] i.e. those who work for their Next Life. [ix] i.e. Moses and his brother Aaron, peace be on both of them. [x] By doing righteous works, and giving alms to the poor and needy. [xi] i.e. a sign indicative of Our Ability, when We created Jesus without father. [xii] After the event of the crucifixion. [xiii] i.e. angels and prophets consult Gabriel about their affairs. [xiv] i.e. say, O Mohammed, to the idolaters. [xv] ‘Lord’ means: possessor or owner. [xvi] The largest city in the south of Iraq. [xvii] i.e. they will not be rewarded for their works; because they shared others together with God in the worship. [xviii] i.e. they think that - by sanctifying and glorifying the saints, imams, sheikhs, prophets, and Jesus Christ – that they are acting righteously. All praise and gratitude is due to God our Master: the All-Forgiving and Most Gracious.